Johnson & Sons was an established company of London's assayer clan Johnson. Since acknowledged assayers had easy access to gold and silver the company could supply photography pioneer Tom Wedgewood with silver nitrate for his silver picture experiments at the end of the 18th century, and it started production of silver salts needed for photography as soon as photography was officially introduced in 1839, first by Daguerre, then by Fox Talbot. It became manufacturer of mainly photo chemicals, some medicine, and later even Litmus, the agent for the famous basic/acid-test Litmus Paper. In 1914 a chemical plant was built in Hendon. Among its products was the new developing agent Amidol. In World War I the company was photo-chemicals supplier for the Royal Flying Corps RFC as well as for other troups, governmental departments and war allies. In 1927 the factory was capable to serve the photographical branches photography, cinematography and radiography. The whole company moved to the growing Hendon site. In 1940 the company started the world's first industrial Litmus production. 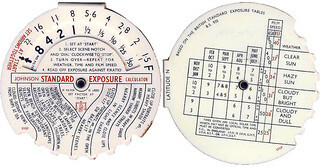 After the bombing of Ensign House in the same year by the German Luftwaffe Johnson & Sons took over Houghton-Butcher's remaining stock of enlargers, epidiascopes and cine cameras. 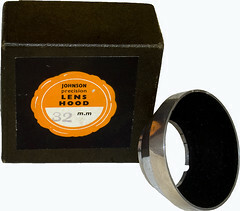 In 1948 the company finally became Johnsons of Hendon Ltd., established of course as chemical plant, but as well as distributor of other photography supply and cameras. 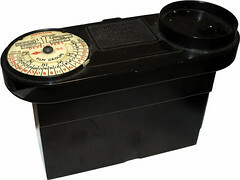 It became importer of Voigtländer, eumig and Plaubel cameras, with its department Photographic & Graphic Arts Supplies. 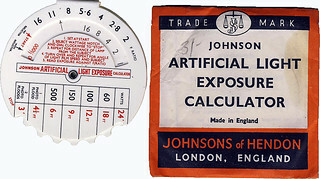 Several accessories like development tanks were produced, and sold under the Johnson brand. From 1985 to 1989 Johnsons of Hendon bought and finally merged with Photopia into Johnsons Photopia. This page was last edited on 6 March 2019, at 04:36.